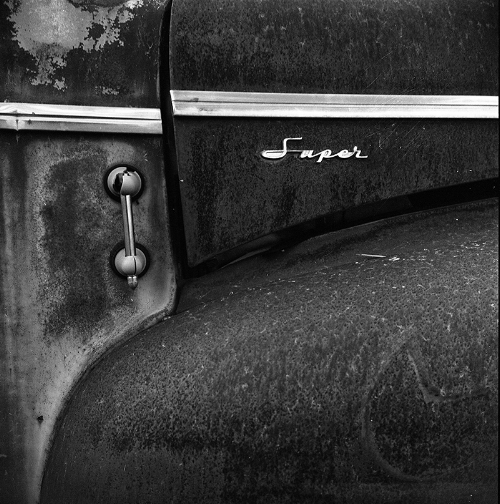 The boys waited in the air conditioned car while Papa roasted in the humidity to grab a few shots at my favorite old car graveyard outside of Washburn, while on the way home from a day trip to Madeline Island (in the Apostle Island group in Lake Superior). The light was horrible and the lens shade was barely adequate. My mint Agfa Isolette III with 3.5 Solinar is for sale on Ebay. It is frustrating when shooting the boys with an uncoupled rangefinder, so I purchased a near mint Rolleicord Vb to replace it. Last week, I finished selling all of my digital (Canon 5D Mark II and L series lenses) equipment on Ebay. The buyers were all quite happy with the condition, as I an OCD about caring for my valued things. For the little I use digital, my Apple 7+ phone camera works quite well.